Immunofluorescence assay of P. falciparum infected erythrocytes (IE) using various antibodies. Localization of DAPI (blue), P2 (green); various antibodies (anti-PfP1, anti b-tubulin, anti-PfP0, and anti-MSP1) in red at the di-nuclear (DN) stage of Plasmodium falciparum infected erythrocytes. Scale bar indicates 2 mm.Das S, Basu H, Korde R, Tewari R, Sharma S. Arrest of Nuclear Division in Plasmodium through Blockage of Erythrocyte Surface Exposed Ribosomal Protein P2. PLoS Pathog. 2012 Aug;8(8):e1002858. Immunofluorescence assay of P. falciparum infected erythrocytes (IE) using various antibodies. 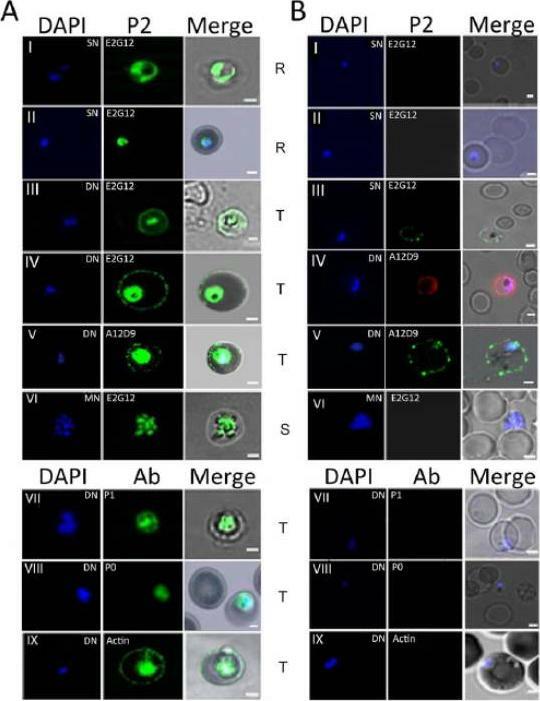 (A) & (B) show confocal images of permiabilized (IFA) and unpermeabilized in solution (SIFA) assays respectively, of different IE stages (I, II: Ring; III, IV, V, VII, VIII, IX: trophozoite; VI: schizont) IFA analysis of permeabilized IEs from asynchronous cultures of P. falciparum 3D7 showed a transient presence of P2 protein on the IE-surface at certain stages of development (A). This was often coincident with a dumbbell shape, elongated or crescent shaped DAPI stained nuclei (henceforth designated as the di-nuclear or DN-stage). It was not seen with the tightly packed single nuclear (SN) rings, nor the multi-nuclear (MN) schizont stage IE-surfaces (A). 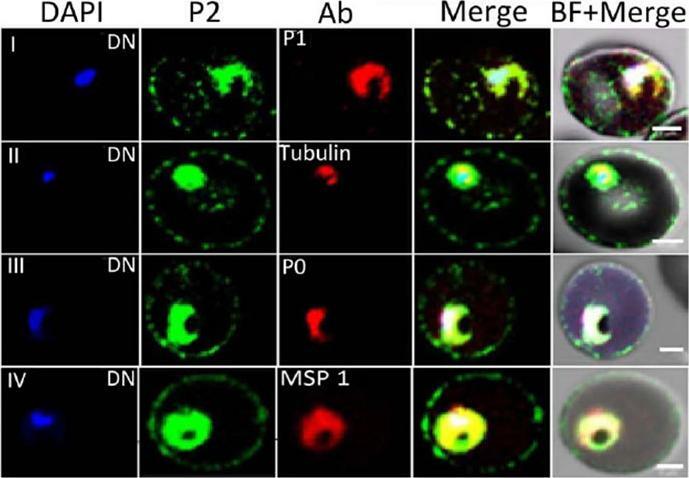 Cytoplasmic P2 staining was observed at all stages (A). To test for surface exposure, unpermeabilized solution immunofluoroscence assay (SIFA) was carried out which confirmed the presence of P2 on the outer IE surface at the DN stage but not at the SN or MN stages (B). Two different anti-P2 mAbs, E2G12 and A12D9, as well as two different secondary antibodies with different flurophores (Alexa 488 and 594) showed similar results, confirming the specific surface reactivity of PfP2 protein.Das S, Basu H, Korde R, Tewari R, Sharma S. Arrest of Nuclear Division in Plasmodium through Blockage of Erythrocyte Surface Exposed Ribosomal Protein P2. PLoS Pathog. 2012 Aug;8(8):e1002858. Upper panel: IFA of synchronized P. falciparum cells using DAPI (blue), P2 (green), and bright field of IE at various time points PMI in parasite development. Scale bar indicates 2 mm. Confocal microscopy of P2-GFP transfected cells at different stages of parasite growth. DAPI (blue), P2-GFP (green). GFP on the IE-surface at 28–30 hrs PMI trophozoite stage, but not at 22–24 hrs or 40–42 hrs.Lower panel: (D,F) Confocal microscopy of permeabilized IE showing D) Red: anti-PfP2 mAb E2G12; F) Red: anti-PfP0 mAb E5F4; Green: P2-GFP staining of Pf3D7 P2-GFP infected RBCs. (E,G) Solution immunofluorescence (SIFA) of DN Pf3D7 P2-GFP infected RBCs showing E) Red: anti-PfP2 mAb E2G12; G) Red: anti-GFP antibody; Green: P2-GFP staining of Pf3D7 P2-GFP infected RBCs. 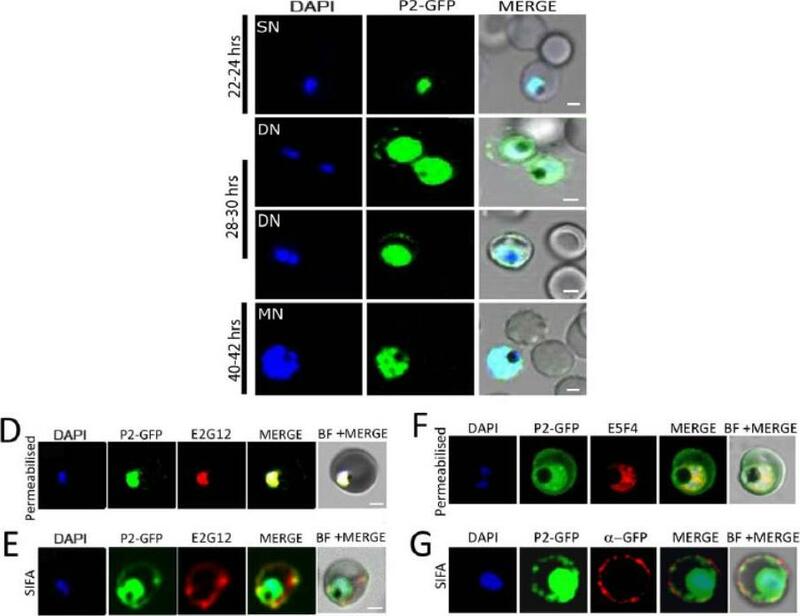 Unpermeabilized SIFA at the DN stage showed that the P2 staining and GFP colocalized on the IE surface (4E).Das S, Basu H, Korde R, Tewari R, Sharma S. Arrest of Nuclear Division in Plasmodium through Blockage of Erythrocyte Surface Exposed Ribosomal Protein P2. PLoS Pathog. 2012 Aug;8(8):e1002858.